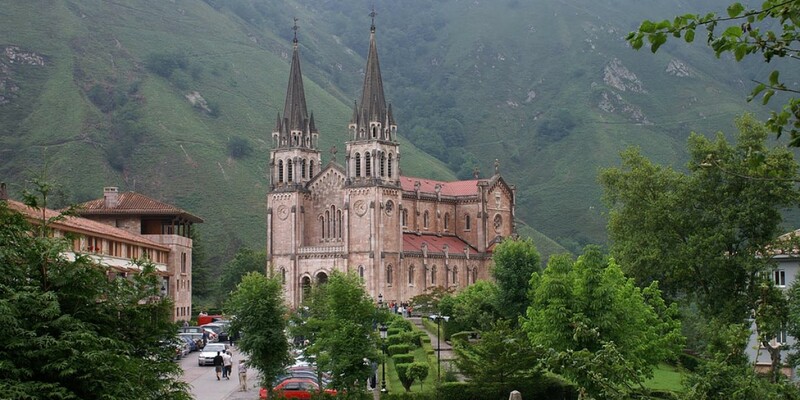 Just about 50 kilometers from Llanes we can approach the Mountain of Covadonga, one of the cardinal points of Asturias. A space surrounded by legend and history, place of worship for the devotees of the Virgin of Covadonga, "La Santina" Patrona de Asturias, Real Site that faithful, tourists and mountain lovers approach. Legend around Pelayo that in this place, armed with stones and little else, the Asturians began the reconquest of the peninsula and the establishment of an entire kingdom of Asturias. also it tells the story that the Arabs retreated. ancient chroniclers argued that the origin of the cult of Santina is lost in time and in the time of the Virgin Pelayo was an undoubted influence reference to Her faith was manifested in the Christian victory. "Pequenino and galana" as the song says, his image remains in a cave. He dug into the rock is undoubtedly one of the most beautiful spots of Covadonga and is attended by a few thousand pilgrims in search of grace. The huge rock just below the grotto of the Virgin, an impressive waterfall that is, in its fall a lagoon, where visitors must perform the rite of throwing a coin to obtain, through this act, the desire requested arises. The Basilica de Covadonga was built between 1877 and 1901. The disappearance of their original plans, possibly during the Civil War, left without its original radiograph. However, this monument is considered one of the best examples of neo-Romanesque architecture of the late nineteenth century. The temple is visible from everywhere and, within the calm and peace that undoubtedly extend into the surrounding space breathe. The Real Sitio de Covadonga is a natural gateway to the National Park Picos de Europa. Only 12 km away, it upward through a narrow, steep road, you reach the beautiful places where the Lakes Enol and La Ercina: Los Lagos de Covadonga. One of the legendary stages of the Tour of Spain and a haven where the palette of blue, green and gray becomes infinite.